At the moment the Java-Editor is available in five languages. Each language uses a language-file. You like the Java-Editor in your language? Open the language file “english.ini” and translate the value parts of the name=value pairs. 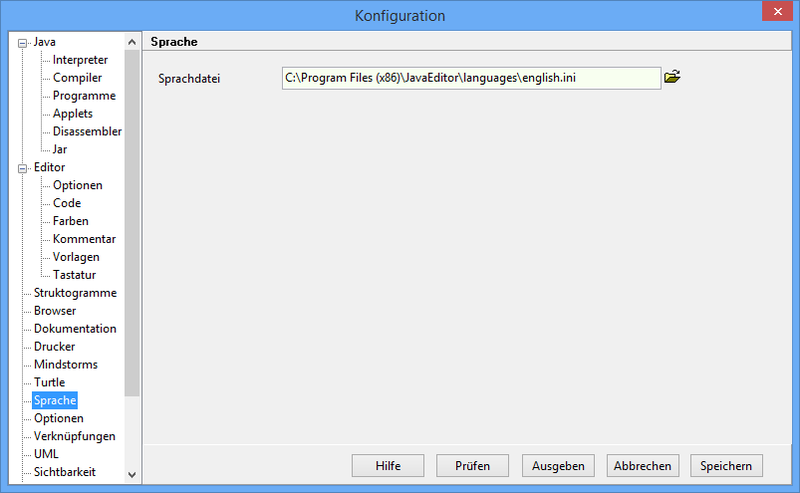 If the Java-Editor shows deutsch instead of english, you choose Fenster/Konfiguration from the main menu, select Sprache from the configuration options and then the language file “english.ini” as shown in the picture. After choosing the correct languagefile you save the new configuration with “Speichern”, the rightmost button.